For further exploration and fun we have included some more links, let us know if you have any to add! 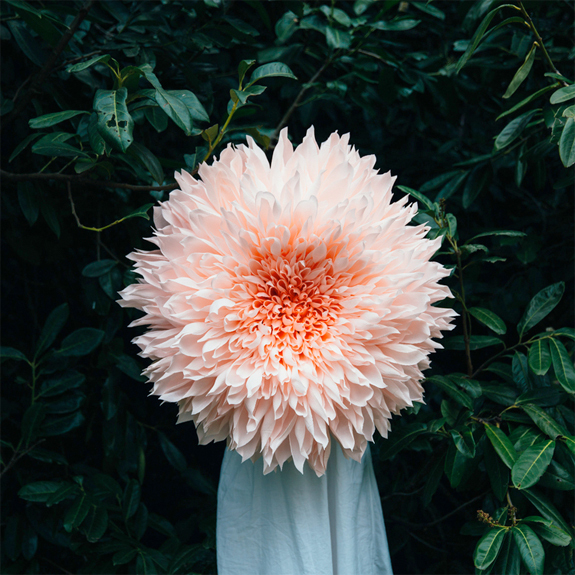 Photographer Kari Herrer has created a whole series based on her floral photography paired with her pencil illustrations, such an amazing idea! 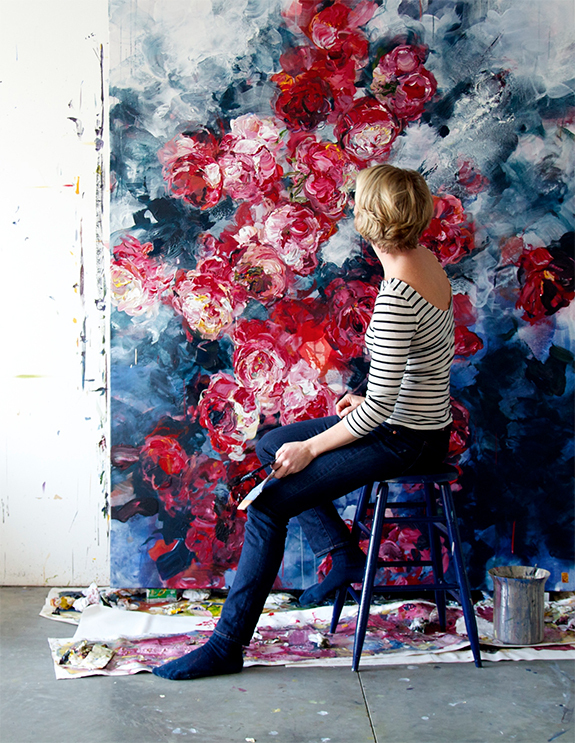 You really need to Google Image Ellie Cashman’s dark floral wallpaper to get the full impact! 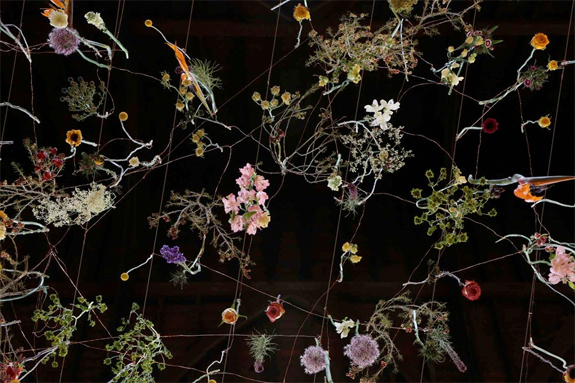 Rebecca Louise Law is an artist whose medium is flowers, now that is taking the bloom muse to a whole new level. 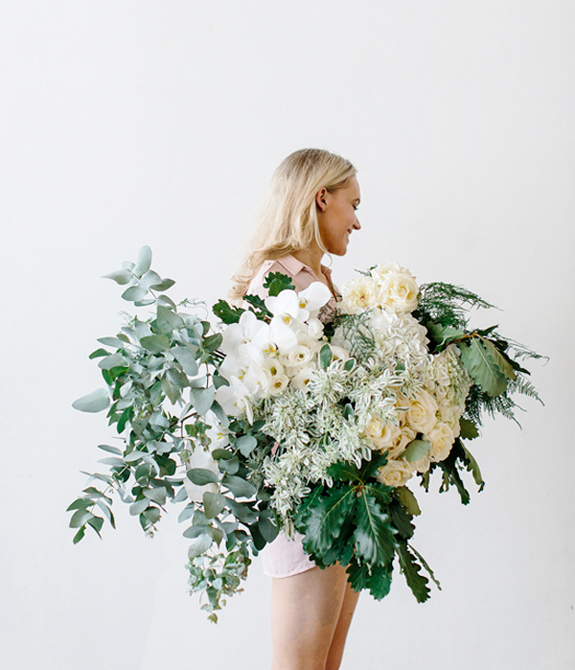 Of course there are wonderful floral designers (and I often wish I was amongst them, it’s one of my many ‘in my wildest dreams’ careers), but to be an artist that actually uses the blooms as her ‘tool’ is a whole new level. 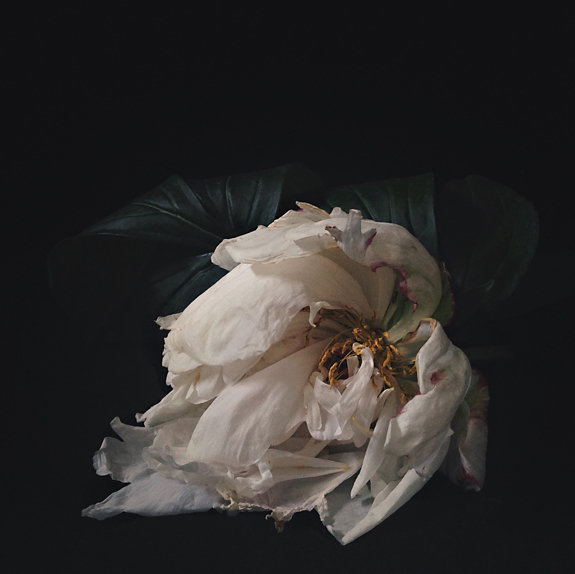 The concept is to embrace the ephemeral nature of the flowers, in that respect the installations will change over time, exploring life and death. Personally both Michelle and myself find the dying bloom to be just as inspiring as the freshly pricked, it’s a new dimension of beauty to explore. 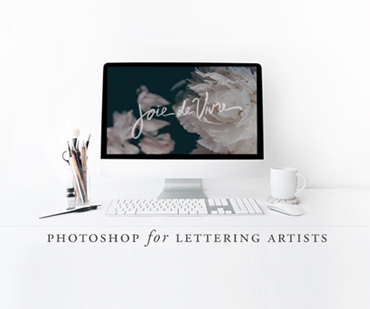 As you can gather from the few artists that we have featured thus far this week, there is a myriad of ways to express your bloom muse, to take a subject that is so ubiquitous and re-envision it in your own signature way. 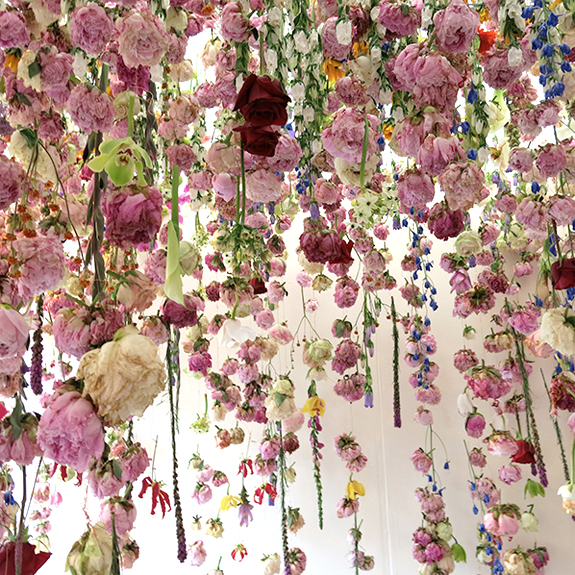 The suspended garden installations that Law creates are so epic in their proportion and vision, there is no reason that you can’t find your own creative seed of inspiration from this or any of the other featured artists. My belief is the world needs creative people, there is room for you and your explorations, if not just for your own personal fulfillment. The goal for most that have a burning desire to seek to do something creative is to be able to do it for a living and I do think there are opportunities that abound, what will make your vision unique? Is your art timely or timeless? The three featured artists we have featured, their work is both, meaning that it feels very current, but I don’t imagine it being something that they or a collector will ever cringe at years from now. 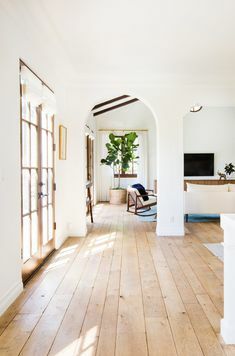 I have been guilty of that in the past with the early stages of my design business, doing what was on trend and what clients wanted, but not following my gut and doing what I knew would be timeless–lesson learned. 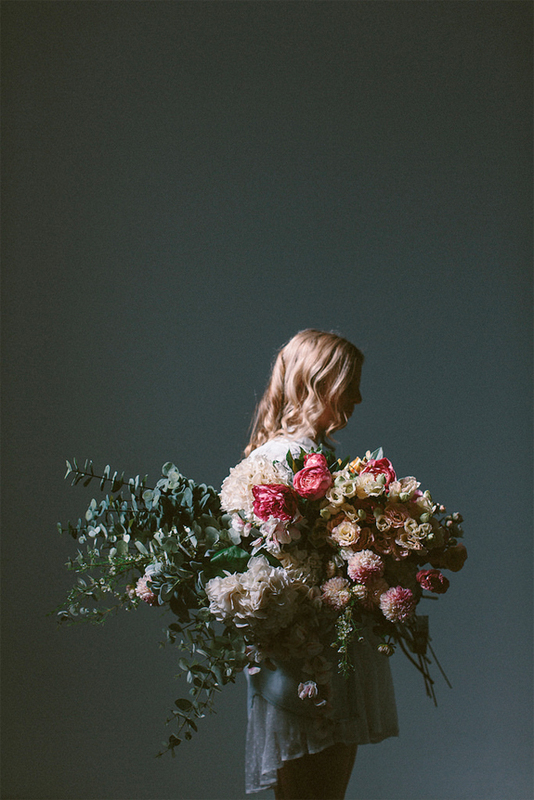 Michelle and I are both dizzy with admiration over Luisa Brimble’s ‘Girl Holding Flowers’ portrait series. We are always brainstorming unusual ideas for portraits for the camera shy and the person that prefers a little intrigue to their capture, but Luisa’s portraits, insert low whistle here, what an incredibly modern + classic approach, so unique and easily identifiable, bestill my branding maven’s heart! Each one is more beautiful than the next, truly works of art. Honestly, I would have never thought of this in ten million years, so simple and elegant, oh how I wish my brain would take me to the place where I could come up with something so insanely wonderful! Perhaps one day we will be able to ask the lovely Luisa how she came up with such magic, but for today I hope ogling will suffice. Michelle and I have tried to maintain one constant on this blog and that’s to always write about what interests us and what we find inspiring. We find that most of the time it will also resonate with you, it may be something of a collective consciousness, you know when you start to be interested in something and all of a sudden it seems like so many other people are as well? When I was in fashion I was always awed by this phenomena amongst designers, there was just no way to explain how every designer worth his/her salt all of sudden was introducing the same type of X, Y, Z. It was spectacular and I still am perplexed by it, how? I don’t know the answer to that I’m afraid, I wish I did though! We are introducing a series called MUSE, we thought we would launch it with a ‘week of’ posts, we wanted to explore the idea of multiple creatives in different disciplines with the same ‘muse’ and how they interpret it. I think this is an amazing exercise, especially if you are feeling forlorn that an artist is doing something that you wished you would have or that you were working on and they got to it first. There are just so many ways to interpret the same ‘muse’ we hope that this series inspires you to find your own unique creative take on a subject or that you discover an artist that you want to explore more of. I know that when I was doing my research I felt wildly inspired (and yes, maybe a bit envious) but more motivated to try to figure out what my own muse is. First up is artist Bobbie Burgers! 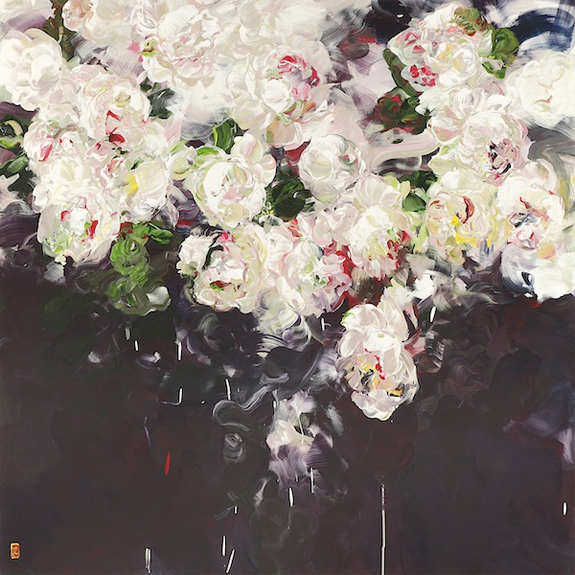 Michelle introduced me to her large scale acrylic blooms and I have to say it’s hard to get out of my mind. It has made me proclaim that I want to paint (even though I have never done so before), not that I can draw either (but more on that later), but her work makes me want to learn. If someone inspires you enough to take up a new skill then they must be doing something right. I won’t bore you with my commentary, Burgers it seems is a darling of the art, home decor and fashion world and there is much to read up on this dynamic individual so I will provide you a list of resources to do just that!